All you need, pre-assembled in ONE badge! Simply peel away the liner from FRONT part, press together and issue to visitor! Quick-Tab ONEstep TIMEbadge Expiring Badge (1-Day) - 500/Pkg. The brand new ONEstep Quick-Tab Expiring Badge is activated by simply folding under the bottom tab! It's the totally reliable way to ensure visitors have access to a facility, but only for as long as they're supposed to! ONEstep Expiring TIMEtoken Indicator "Valid This Date Only" - 1000Pkg. Item#02102 - Turn any badge into an expiring badge with a TIMEtoken. These One Day expiring ONEstep TIMEtokens come Pre-assembled, and can be applied to any badge or object you wish. ONEstep TIMEbadge Manually-Issued Expiring Badges (1-Day) - 500/Pkg. Item#0200X - TEMPbadge TIMEbadge ONEstep One-Day expiring badges expire gradually (approx.15 hrs. ), revealing a red color change that is highly visible from a distance. No hardware or software needed - simply write on the badge, peel away liner, press together, and issue to your visitor. Thermal Printable ONEstep TIMEbadge Adhesive Expiring Blank Badge (1-Day) - 500/Pkg. Item#02011 - Thermal-printable one-day expiration BLANK Adhesive ONEstep TIMEbadge expiring badge. Simply peel away liner, press together and issue. These adhesive badges come fan-folded for printing from any direct thermal printer, and can be used with any visitor software system. They come blank so you can customize your own layout with text or your logo. - 500/Pkg. 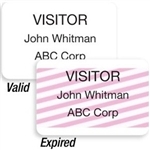 ONEstep TIMEbadge Manually-Issued Clip-On Expiring Visitor Badges (1-Day) - 500/Pkg. Item#02014 - Manually-issued Clip-On One-day expiration ONEstep TIMEbadge expiring badge pre-printed with "VISITOR" . Simply peel away liner, press together and issue. Use with Cardclip #08075 for easy application. - 500/Pkg. Note: It is not recommended to apply adhesive badges to delicate materials such as corduroy, silk, vinyl, leather, or suede. Thermal Printable Quick-Tab ONEstep TIMEbadge Expiring Badge (1-Day) - 1000/Pkg. Item#02031 - The brand new ONEstep Quick-Tab Expiring Badge is a top quality, fold under, expiring badge that is simple to use. It's the totally reliable way to ensure visitors have access to a facility, but only for as long as theyre supposed to!